The Supreme Court bench of Chief Justice Ranjan Gogoi and Justices S. K. Kaul and K. M. Joseph adjourned the hearing on the fresh four petitions regarding the entry of menstruating women between the ages of 10 and 50 years to the Sabarimala Temple. The 49 review pleas are scheduled to be heard in chambers by the Chief Justice and Justices Rohinton Nariman, A. M. Khanwilkar, D. Y. Chandrachud and Indu Malhotra at 3 PM on Tuesday. “First the review petitions will be heard. After the orders on the review petitions, we will deal with these writ petitions. Please wait till 3 PM. If the review pleas are dismissed, we will take up the writ petitions. If they are allowed, we will tag the writ petitions with the review”, stated the Chief Justice. Earlier the Bench has turned down the request for an open court hearing of the review petitions against the September 28 verdict of the apex court in the Sabarimala controversy. 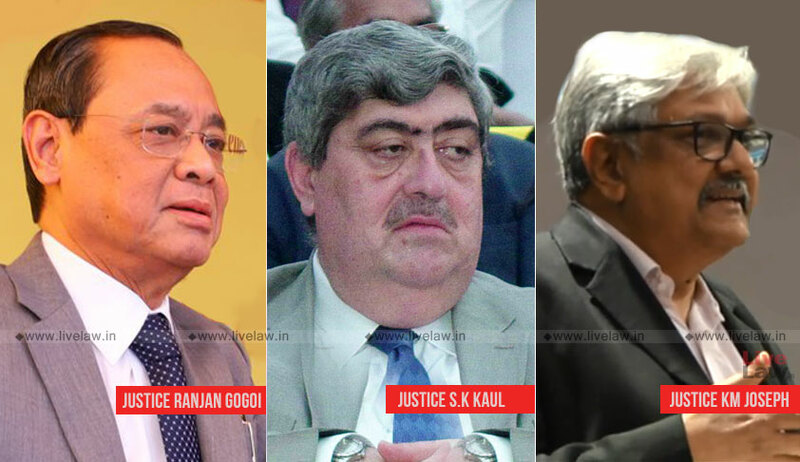 The review petitions will be considered in chambers by the Chief Justice and Justices Rohinton Nariman, A. M. Khanwilkar, D. Y. Chandrachud and Indu Malhotra at 3 PM later on Tuesday. The review petitions, by inter alia the Nair Service Society and the National Ayyappa Devotee(Women) Association, rely heavily on the dissenting judgment of Justice Indu Malhotra to contend that constitutional parameters of rationality cannot be blindly applied to matters of faith. The review petitions also state that the Court erred in entertaining the PIL without examining the locus standi of the petitioner. It is contended that no woman devotee of Lord Ayyappa would want to visit Sabarimala temple, and hence the Court erred in adjudicating the issue on a petition filed by a party who is totally alien to the temple customs. Further, it is pointed out that Court wrongly concluded that the basis of prohibition was physiological nature of women. According to the review petitioners,the practise was rooted in the “naishtika brahmachari” character of deity, as per which the deity cannot be in the presence of women. The practise is therefore not derogatory to the dignity of women, it is argued. A five-judge constitution bench by a ratio of 4:1 had held that women of all age groups should be allowed entry in Kerala’s Sabarimala Temple.